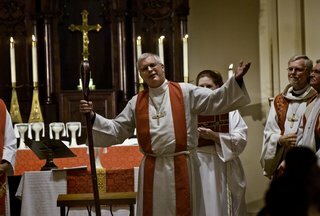 These are reflections on my decision to pursue Holy Orders in the Episcopal Church. There will be reflections on this process from time to time as I take my steps toward ministry in this church. Journeys! Sometimes the destination comes in the silence of the night, or of an email. Late one evening, having just come home from something with Arthur, I quickly checked my email. Quietly it revealed itself, first by its address - Bishop Marc H. Andrus, and then by it's content, "I would be most happy to receive...". The journey had ended, and a new one is now to begin. Looking back, I now realize that I took a good four years to figure things out. Some of those years were spent quietly in a pew, given as advice by Canon Michael Hansen. Some of those years were wandering in and out of churches, not wanting to be "retired", still feeling called to ministry. Some time was spent in frustration, with others not understanding my intentions, and perhaps, I myself not understanding my intentions. There have been many shepherds. Certainly my father and my mother, and my brother Tom, who shares this journey with me. My sisters have weighed in, and definitely my daughter, who called my dogged search "courageous". There has been Tom Crum, my father in God, and his wife Sarah. My good friend, Tom Tragardh, with whom I've shared many meals and many moments of just trying to understand the call, has been a constant guide. And there has been Arthur - always challenging me, always asking the right questions, always giving me room, or gently prodding me. These have been my background radiation - always there. 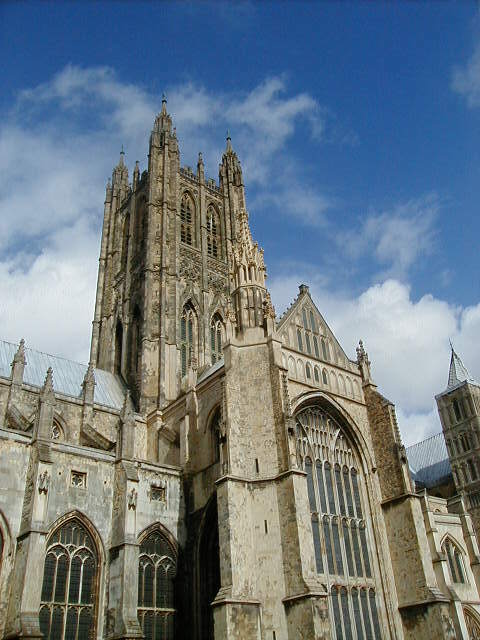 Then there are those who have come from my new associations in the Episcopal Church. James Tramel, whose life and mission still blow me away, and who has stood by me, even in his own difficulties. I owe him a great deal. Once he said, commenting on my vigil in the pews of Trinity Church, "...it bothers me to see you just sitting out there. You need to be at the altar, in the pulpit. You need to be in ministry." It was under his tutelage that I became licensed to officiate under the agreements between the Episcopal Church and the Evangelical Lutheran Church in America. Otis Charles, former Bishop of Utah, and now interim rector of Trinity Church has been my current mentor, along with David Forbes, Elizabeth Newnam, and Jan Cazden. All of them adding little bits of encouragement and learning. The best was from Elizabeth, a fellow priest at Trinity, who said, "Well, Michael, if you really want be a priest in the Episcopal Church, you have to be somewhat of a character." 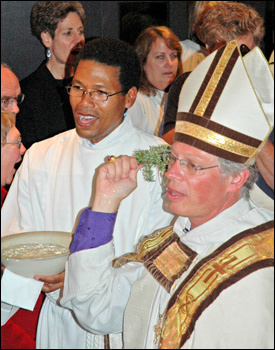 I've chosen the pictures of Bishop Marc Andrus, above, because they characterize the journey, and because he is such a wonderful model of ministry. 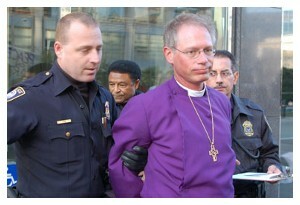 Holy calm, holy arrest, holy things are all brought together. But there is another Bishop Mark. 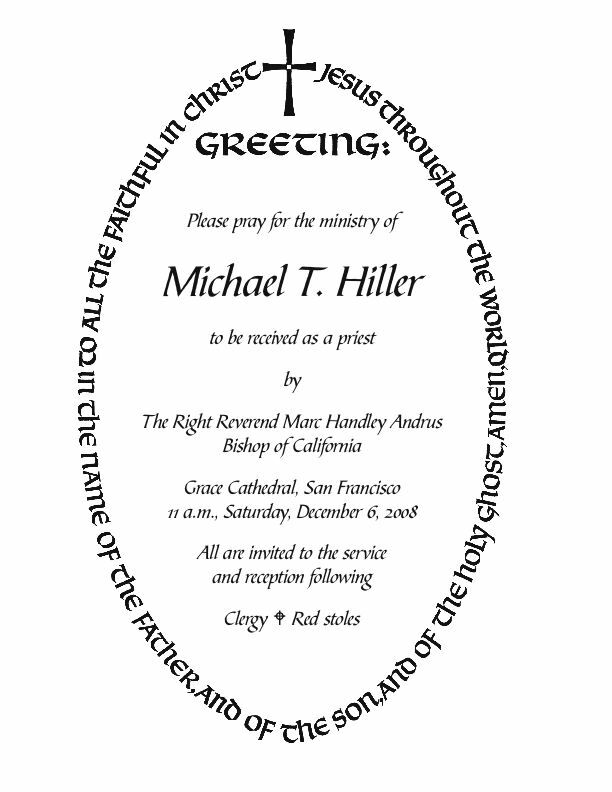 One of my last acts as a Lutheran pastor was to make an appointment with the new bishop of the Sierra Pacific Synod of the ELCA, Bishop Mark Holmerud. We met for some minutes on a late Thursday afternoon. I needed Letters Dimissory from him, transferring me from his ecclesiastical oversight to that of the Bishop of California. It was a wonderful moment of closure and respect. He was interested in my journey, and respected the destination. 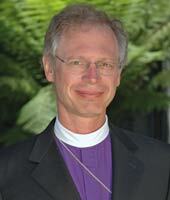 I was impressed that we were starting to grow Lutheran bishops who weren't afraid to be the Church. So we talked, realizing that my leaving would not end the conversation, or even my ministry in the Lutheran Church. It was here that I realized that I was not alone in my journey, in my discernment, in my search, or in my vocation. So many were walking with me.